Spain invoked Article 155 taking direct control of Catalonia placing the state under the authority of the Deputy PM. An election will shortly take place. Massive pro-unity demonstrations have calmed nerves. HSBC reported Q3 adjusted pre-tax profit of $5.44bn with operating expenses down 9%. About 78% of HSBC’s profit was made in HK/ China and other Asian locations. Ryanair announced interim revenues jumped 7% to €4.42bn and EPS of €1.07 up 16% despite a 5% drop in average air fares. PM Theresa May keynote speech at the Tory Party Conference promised a cap on energy bills and a £2bn investment in affordable housing. GSK reported Q3 sales of £7.8bn up 4% with EPS of 24.8p up 49%. Q3 was overshadowed by a conference call during which the CEO highlighted GSK’s appetite for major acquisitions. M&A featured heavily in October with takeover approaches for Aldermore, Imagination Technologies, Millennium & Copthorne Hotels and Spire Healthcare. US President Donald Trump is expected to name Jerome Powell as next Federal Reserve Chairman after a very public and unprecedented “beauty parade” of potential candidates. The Bank of England spent October teeing investors up to expect an imminent hike in UK base rates. On the 17th October Governor Carney said “the judgment of the majority of the committee is some raise in interest rates over the coming months may be appropriate”. Whilst arguably priced in, of equal importance will be the guidance the MPC provides about rates in 2018. An avalanche of takeover approaches and numerous bond buybacks over October suggest corporate investors want to do their deals before the rate cycle turns and/ or sterling becomes more expensive. But talking about deals/ doing them are different things. Reporting an impressive Q3, the GSK CEO hosted a conference call that caused immediate concern over i) possible GSK acquisitions ii) GSK dividend affordability post 2018 iii) the CEO; resulting in the largest 2 day share price fall for GSK since 2008. GSK must now get its institutions onside again after a raft of price cuts. RBS reported a Q3 profit of £392m taking the nine month profit to £1.331bn leading some to suggest RBS has finally turned the corner a decade after the crisis. Sterling ended October at $1.32 and had a more confident tone, despite the lack of progress in Brussels. The re-election of Shinzo Abe in a landslide victory (313 seats i.e the “super majority” of 2/3rds parliamentary support required for constitutional change was met with a further 1.1% gain in the Nikkei, setting a record of 15 consecutive days of Nikkei 225 index gains. Abe’s agenda is constitutional reform aimed at altering the pacifist constitution specifically Article 9, the war renouncing clause. Many Japanese are concerned at North Korea’s bellicose stance and missile launches and view Japan as vulnerable to attack. On the economy Abe plans to raise consumption taxes to 10% in order to raise Y5.6trn ($46bn) in government revenues. This might impact Japan’s GDP growth expected at.2.5% for 2017. 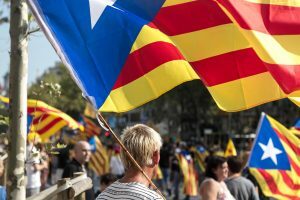 The Catalan independence movement might have experienced its high water mark. The illegal independence referendum, which took place outside the constitutional framework, and subsequent independence declaration by the Catalan parliament, left Madrid with little choice but to invoke the direct control authority under Article 155. Elections will now follow. The subsequent departure of Carles Puigdemont to Brussels looks like panic following massive pro-Unity demonstrations and an arrest warrant. I don’t quite see the EU riding to Senor Puigdemont rescue. Quite the reverse, Spain appears to be pulling together and heeding its King’s televised warnings. The Catalan problem is unlikely to derail Spain’s recovery. GDP was 0.8% in Q3, slightly down on the 0.9% Q2 growth, annual GDP growth is expected at 3.1% one of the fastest in the EU. 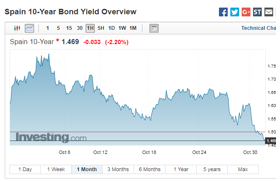 Remarkably Spanish 10 year bond yields ended October at fresh lows, helped by the ECB’s continued commitment to bond buybacks, which exerted a bigger influence than Catalonia. 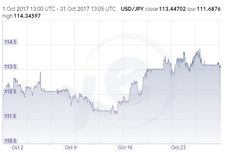 The US dollar weakened towards the end of October as investors focused on the FBI’s arrest of Paul Manafort, the former Trump campaign manager. US President Donald Trump reacted with a series of livid tweets once again appears concerned that the Mueller led FBI investigation will derail the Administration ahead of key Congressional elections. Corporate America’s Q3 has seen earnings reports largely beating consensus estimates, in some cases by a wide margin. The outstanding Q3 was Amazon where revenue growth hit 33% – the shares are on a 280x P/E. The main concern is the degree to which market leadership and direction is concentrated in a handful of high multiple technology companies (the same was true in 1999).